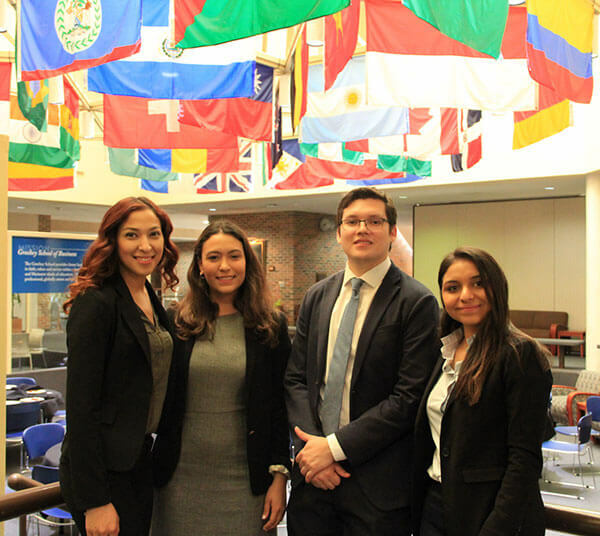 Four St. Mary’s University students in the Greehey School of Business took their business idea to the Network of International Business Schools Worldwide Business Plan Competition, finishing in third place and earning a cash prize on May 18. A dozen teams from the around the world competed, and in the championship round, International Business majors Irving Tóchez (B.B.A. ’18), Ivis Palacios (B.B.A. ’18), Lorena Palacios (B.B.A. ’18) and senior Jennifer Guerra presented their business plan on Eco-Fridge Lockers to a panel of judges in Romania over Skype. The other finalists were the Dublin Institute of Technology and Washburn University in Kansas. Ivis Palacios said her teammates began work on their business plan at the start of Spring 2018. Their business idea of Eco-Fridge Lockers — intended primarily for mid-size industrial clients — consists of compact, stackable storage boxes that refrigerate individuals’ food and medication, using little energy and zero emissions. Palacios said the team’s idea was inspired by their faculty coach, Johnson, who shared with the students two instances in which his iced coffees were stolen when he left them in a communal faculty lounge refrigerator. Johnson also called on alumna Lashelle Villarreal (B.S. ’11, M.S. ’17) — a high performance manufacturing program manager at Johnson Controls — for extra guidance.